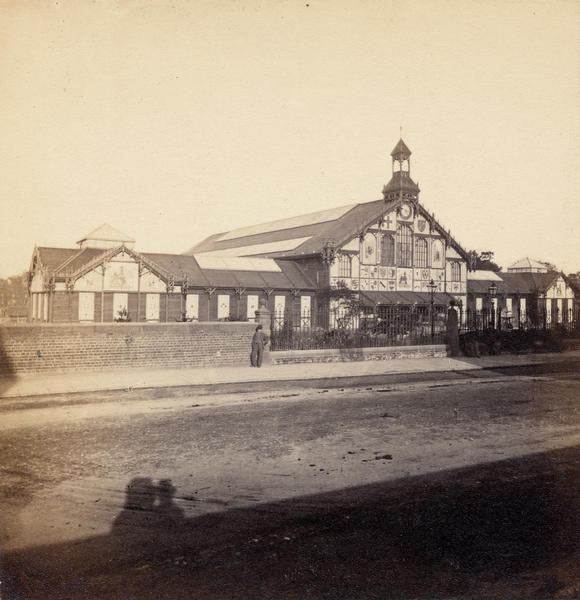 The city archives have a number of photographs of this impressive building, a temporary exhibition hall built in the grounds of Bootham Park — Bootham Field, as it was called back then — for the Yorkshire Fine Arts and Industrial Exhibition of 1866. It opened in the summer and ran until the autumn. 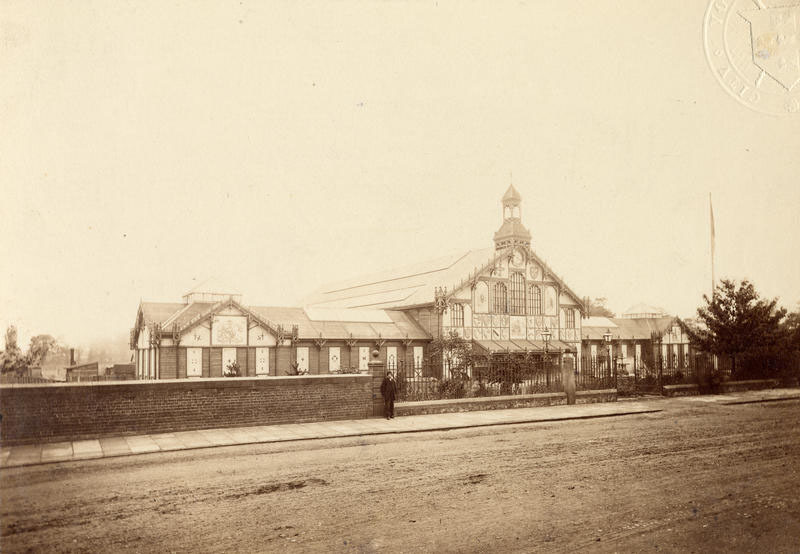 It would of course have been quite a long and more complicated process, in 1866, taking these photographs with the type of camera available then. The railings (and accompanying supporting wall and stone piers) are listed. They date from 1857-8 and, like so many railings in York, they were manufactured by the Walker foundry. They’re very rusty, and some of the stone piers between have lost their ball finials. 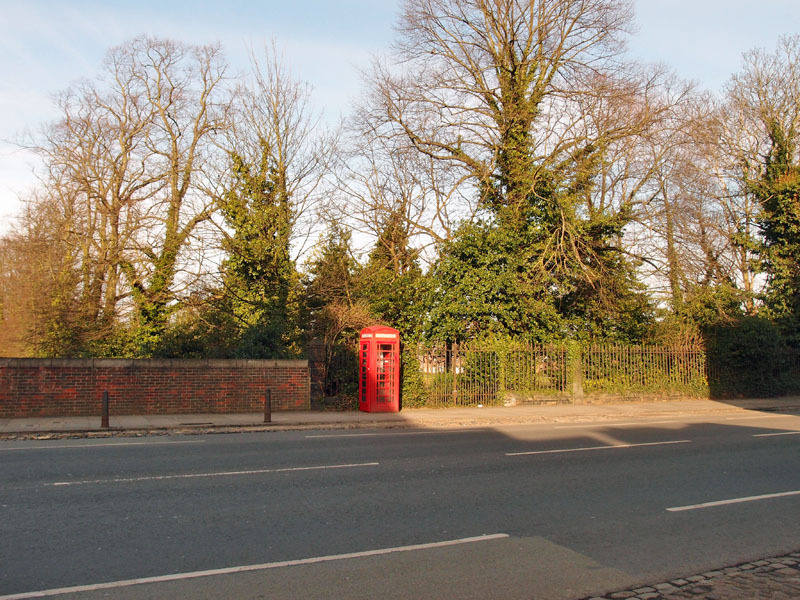 Clearly the trees and ivy have grown in the intervening years and the street has acquired a phone box. Less immediately obvious, but apparent when comparing the photographs from 1866 and 2015, it would appear that the railings originally extended further, that the wall over the railway line was shorter. It now seems closer to the old iron gates. It’s clearly a while since those gates were opened. How long, I wonder. Does anyone remember them open? 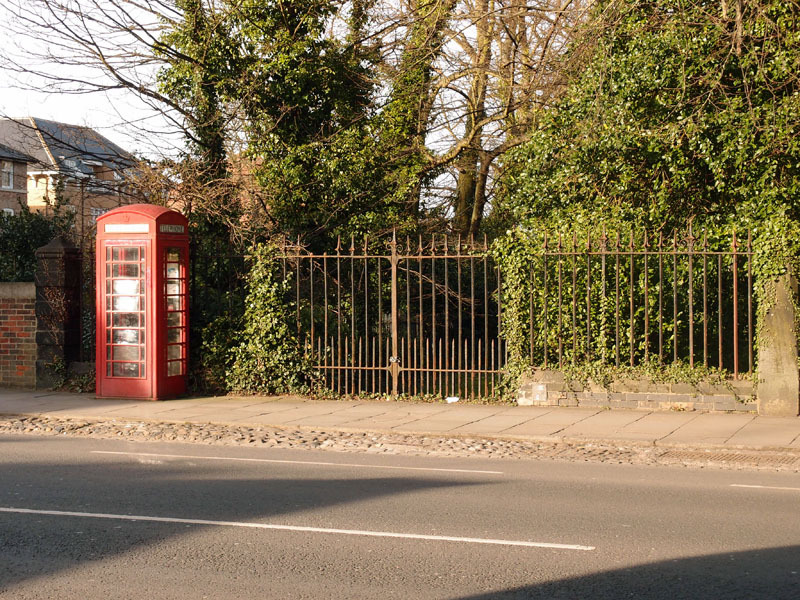 Continue along towards town and you reach another set of rusty iron gates, the main entrance to Bootham Park, allowing access through the grounds. Between these two sets of rusty gates there was, until recently, a very handsome horse chestnut tree. 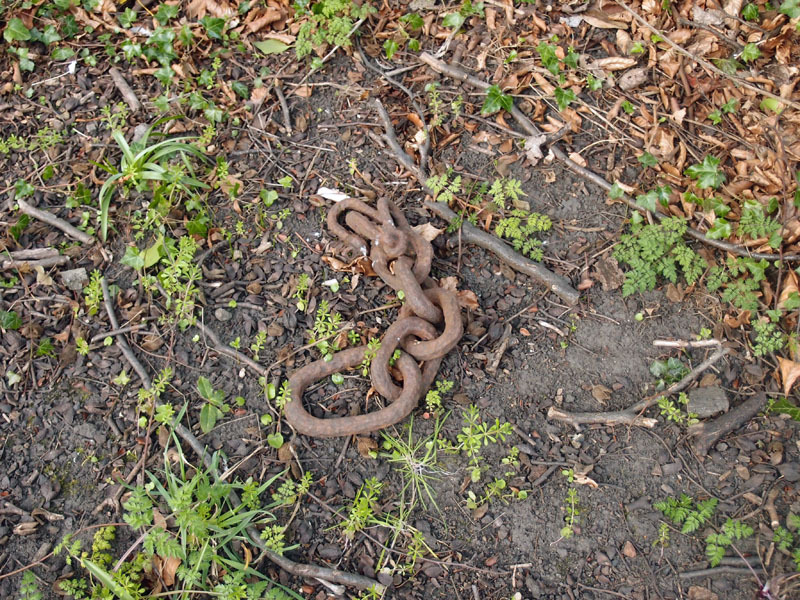 After I wrote about that, a friend mentioned that they’d noticed on the ground nearby a length of rusty chain, and wondered what it had been used for. 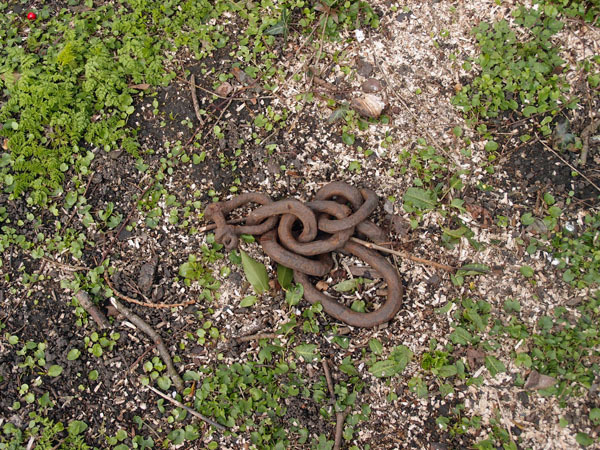 Further investigation revealed that the chain was attached to something underground. And that there were actually several of them. They’re roughly in a line along the front of Bootham Park, under the trees, a few metres back from the railings. Walking into the open area of Bootham Park and looking back towards Bootham it seems that this area is slightly raised. What’s under there? 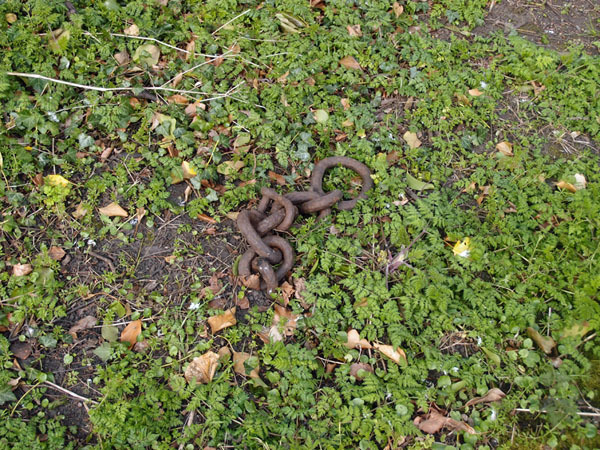 Why are there lengths of rusty chain coming out of the ground under the trees? If you’re interested in these rusty relics and fancy going to have a look for yourself, please be careful about what you’re treading on. That area is one of the few things left alone around here, it hasn’t been reinvigorated, it has the natural vigour of a place where plants and trees do their thing without being unnecessarily interfered with. It may just look like scruffy weeds and litter, but in the next few weeks it will fill up magically with springtime growth and even wild flowers, and they’re just emerging now. So please tread softly, and don’t squash the cow parsley.